Michael Pineda’s debut has been dissected many places, and you’ve seen Dave’s write up, but I want to specifically discuss Pineda’s change and what it did and didn’t do against the Rangers. Pineda pitched brilliantly against righties but gave up three XBH to the seven lefties he faced. Was this due to his change-up? Yes and no. The group of nine pitches that break in the opposite direction to his slider are mislabeled four-seam fastballs, but this is his change/two-seamer: this is what he’s developing to attack lefties. One of the best arguments for starting Pineda with Tacoma was that the team could mandate that he use the pitch fairly often without worrying about the results. With Seattle, the team would be less likely to utilize a work-in-progress. In essence, this argument boils down to how you weight the quality of his pitches versus the natural platoon splits they produce. A slider’s got huge platoon splits, but some might argue that Pineda’s slider is so much better than his change that the platoon split issue is dwarfed. We’re all of one game into Pineda’s career, but I’d like to argue that it’s time to start calling the pitch a bit more. 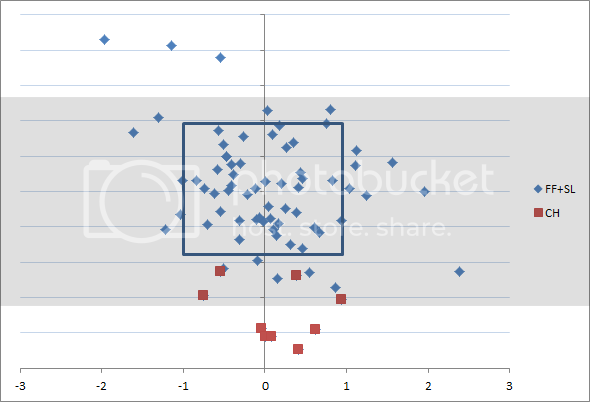 The problem with Pineda’s change-up wasn’t that it was hittable, it was that he couldn’t find the strike zone. When he wanted to go away from his fastball in the 6th, he went to his slider, and that’s what Josh Hamilton and Michael Young drilled for RBI 2Bs. Against Texas, he didn’t have much of a feel for the pitch. His best was his first: the pitch in which he K’d Josh Hamilton swinging. From there, he threw seven balls and induced one foul ball. This is what Dave and others feared: that his location/stuff wouldn’t give Olivo/Moore enough confidence to call the pitch in big situations. That they went to the slider against Hamilton in the decisive 6th bears out Dave’s concerns. But the problem wasn’t that the change was hittable, he was just missing off the plate low. That’s less than ideal, but if you’re going to miss the plate, that seems like a decent place to miss. I’ve added his change-ups to a jury-rigged strikezone plot here. So: against lefties Pineda can either go to a change/two-seamer that he doesn’t yet have great command of, or he can utilize his slider, which is great against righties and poor against lefties. Before Tuesday, we had no way to evaluate that decision. At this point, we’ve got a tiny sample, but it might be worth working in a few more change-ups and a few less sliders against lefties. Versus righties, Pineda can both avoid walks and hard contact. Versus lefties, he may need to choose – at least while he develops a feel for the pitch. If he brings the change-up into the strikezone and it’s actually hit hard by lefties, then they can readjust. But the slider seems like a poor bet against MLB lefties, and his change-up’s shown some promise (the K of Hamilton was probably his best pitch on the night). Call the pitch, Miguel (and whoever’s replacing Adam Moore). And this is exactly why I was hoping he would start in Tacoma for at least the first 2 months. He really needs to get complete confidence with that change, it looks nasty. Don’t get me wrong, I love to watch him pitch. The little ancy kid in me wanted him in the MLB, but for the good of the team, I think Tacoma would have been the right move. Great work. Was hoping someone would do this exact write up. In addition to calling the change-up more in game, remember that he’s probably working it hard on his off-day throwing sessions. Great write up. Thank you very much for plotting this out. I don’t think anyone should be surprised that his change is low. If you don’t have a good feel for throwing a change the easiest thing in the world to do is throw it into the dirt. I don’t particularly think that the evidence shows that he should be throwing it more often, but I don’t really know what the alternative is either. Throwing a slider to a lefty like Hamilton is just asking to be lit up. The encouraging thing is that about half of those sliders were at least close to the bottom end of the strike zone, which allows for the possibility of them being swung at and/or being called strikes. Based on this miniscule sample size, it appears the change certainly still needs work, but probably isn’t a lost cause. Based on a sample size of one — the pitch that aced Hamilton in the first — the change clearly isn’t a lost cause; that pitch certainly doesn’t prove that he’ll eventually have a good changeup, but when it comes to establishing the possibility that he might someday, that pitch has signature significance. Let him throw it — make him throw it; if he can keep it low and occasionally spin one like that, it will do him good as a show-me pitch even if he can’t consistently get it over for strikes. Oh wait, surprise, it’s an 83mph slider. STRIKE THREE! The changeup will make THAT pitch more dangerous too. Pineda is gonna be fun to watch progress– can you imagine, given good health, what he’ll be in 4-5 years? And then, how bizarre would it be to see: Felix Hernandez, #2 pitcher (with 3 Cy Youngs)? I am happy Pineda is in Seattle. Even with that platoon split and that work-in-progress change, he looked pretty darn good against what’s currently the best offense in the majors. I know, I know… small sample size, results-based analysis, and all that. I’m just happy I get to watch him throw the ball. Dave has been on Twitter and the like claiming that Pineda’s change up is “lousy.” If he is including his command of it, then yea, I wholeheartedly agree. But I don’t think his change-up is a bad pitch. If he can locate it, I think it is already big-league caliber. It’s never going to be his bread and butter, but with his dominance of righties, if he can just use it to not get drilled by lefties, I think he could be fine. And I’ll trade him walking lefties for the rips he gave up any day of the week, especially against lineups like Texas. Well, I would’ve rather seem him down in Tacoma working on that for two months — or even the entire season, given that the M’s are probably not contenders — but I can’t deny the joy of having two pitching performances per five to look forward to (maybe even three, if Bedard gets closer to his old self). Of course that could end very quickly if Pineda doesn’t keep throwing / developing his change-up (or he does, and gets lit up anyway). Except if they had drafted him, Bavasi would’ve thrown him in instead of Tillman in the Bedard trade. I don’t believe that, especially given the local connection and immediacy with which Timmuh would have been on the big league scene. Tillman was still a couple years away – Lincecum had already thrown 146 innings in the bigs when that trade went down, and assuredly would have been in the majors for the M’s, if perhaps not in an identical role. The much greater likelihood is that Bavasi would have relegated him to relief ala Morrow and we never would have seen what he could really do. Lincecum’s much more analogous to Morrow than to Tillman. I’m not used to seeing pitchf/x plots with gravity included. What kind of “rise” on his fastball does that translate to w/out gravity? Was that based on watching the game, or did you see a pitchf/x plot that showed this? I watched too, and it seems like you are right, but I haven’t seen anything that shows where he threw it overall. First off, I should point out that it should read “changeups” not “sliders”. No idea how I slipped on that. But to answer your question, you can find it in mark’s “jury-rigged” strike zone plot he linked above.